One of the largest portions of our business is the Team Sports sector. Whether you are the coach of a flag football team or the head coach of a university athletic program or anywhere in between, we can get you what your team needs! This most commonly includes, but is not limited to, complete uniforms, team shoe fittings, and equipment. We have designated salespersons for many local school districts in Wayne, Holmes, and the surrounding counties. These salespersons personally visit coaches at those schools and work with them to take care of all their sporting good needs. If you do not have a designated salesperson, it is not a problem. Our salespeople are always willing to expand and connect with new schools. Simply call the store phone number (330-262-1544), and we will be able to help you. 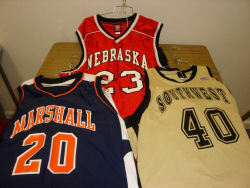 We currently serve as the source for numerous schools when it comes to ordering new team uniforms. You can get custom uniforms from some of the best brands on the market including Speedline, Wilson, Rawlings, Mizuno, and more! Just need practice jerseys or warm-ups? We can do that, too! We have experience in all levels of play, from youth leagues to varsity athletics to college programs. If your team wishes to purchase team shoes, we can provide this service to you along with a team discount price. We can have a salesperson meet with the coach(es) and team(s) for a fitting session to make sure all kids receive the correct sizes. Even though we don’t stock any, we can get many of the popular name brands such as Nike, Adidas, Mizuno, and more. From official game balls to practice equipment to medical supplies, we have all the products you will need for the season. Just some of the brands include Rawlings, Cramer, Jugs, Cliff Keen, Adams, Cutters, Mueller, and many more!